Forum Index > Historical Arms Talk > Scandinavian Pretzel/Kringla/Kringel Swords ~1500 AD. Posted: Sun 07 Jun, 2015 7:13 am Post subject: Scandinavian Pretzel/Kringla/Kringel Swords ~1500 AD. "A very distinctive form of crossguard was, however, used in Scandinavia and perhaps also northern Germany. It takes the form of an open ring, looking rather like a pretzel, and is found on large hand-and-a-half swords whose guards bear some resemblance to later katzbalger guards, though with more twists to them". (page 16). Danish: "Kringel-sværd" (older Danish) or "Kringle-sværd" (modern Danish, but it does sounds if the sword is being made of pastry, so I go for the old Danish as the word Kringel-kroge = eng. nooks and crannies). 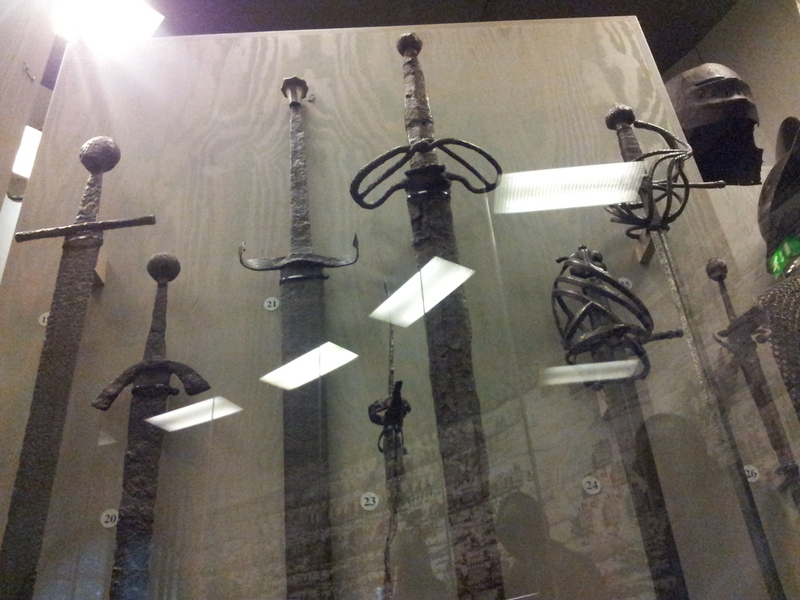 These swords seems to be from around ~1500 AD. I have found a pair of pictures of this "pretzel-type" of sword. 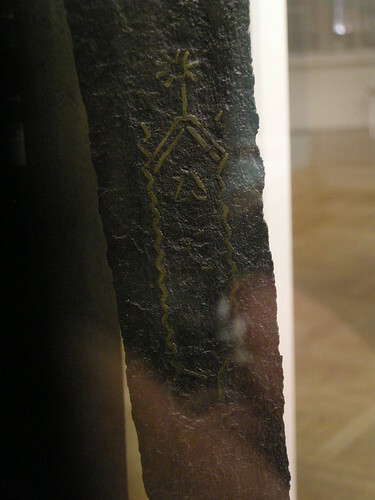 This example was found within Säveån, Gothenburg, Sweden in 1928, now located at Göteborgs Stadsmuseum. [found where Säveån runs out into Göta Älv]. Digressing: In 2012 they again found a sword in Säveån (probably a messer). On page 11, fig 9. From Denmark a well-preserved example was located in Tudeå near Trelleborg on Zealand. So both swords were perhaps deliberately deposited in water. The publication doesn't give any measurements, but it sure looks like a 2-hander. Source: Behrend (1970). Nationalmuseets Arbejdsmark 1970. Pretzel sword from Sweden - end of 1400's. No measurements given. Blade is German, Guard Swedish. This looks more like a hand-and-a-half sword with shorter grip than the Danish example. Here is an older thread where other examples are posted. Thanks for pointing me to a very interesting thread! From looking through the pictures in the posts, they don't seem to show pictures of swords with more pretzel/kringla/kringel- like guard design (as the 3 examples I showed with a pretzel shape when seen from above or below), though this "C-guard" as Peter Johnsson call it, is quite weird and distinctive in itself. So generally Swedish examples with the C-Guard of varying degree of openness and closed-ness (also one from Lund and one from Göteborg in the thread, beside the Vättern sword you showed), and I haven't seen any Danish ones yet with that kind of guard (I don't have museum access, though). Beware: A bit of silliness. Because "en kringle" needs to at least have the shape or maybe even interlock to be a "kringle"; if it is not interlocking it can perhaps only be a half "kringle". Sorry for now digressing totally. It's a bit like the joke we have about Icelandic people: Who is most ugly? "Halvgrim Helgrimsson or Helgrim Halvgrimsson" [invented variations of the name Hallgrim/Hallgrímur]. Here is a twohander from Finnish National Museum. Blade is described as being German. This "pretzel" guard seemed very odd to me so it's nice to see some other examples too. Very good picture of a full pretzel guard. So one from Finland as well. Probably most of the blades are German and the "Pretzel" is made locally! Just next to it, one with an "open C-guard" as well! I know of a few others that I don't think have previously been posted. Thanks for showing all these swords, Mark. So a lot from Norway as well ! I would be interesting to see how big the more obvious pretzel two-handers are in size comparable to this probable hand-and-a-half sword. From Worsaae (1859): Nordiske oldsager i det Kongelige museum i Kjöbenhavn. Overview Book about fine items at the National Museum, so no info other than very general period (Medieval). Interesting if this is early or late type. No idea yet where it is from. I makes it possible to link to some more pretzel swords from the Nationalmuseum, Copenhagen, Denmark. Found a little info on one of the "hel-kringel" sword in Nymark (1980). It is the a) sword on Bruhn-Hoffmeyer given on plate XI below by Mark. It is 138 cm long so clearly a 2-hander. It is likely another very old member of the Nationalmuseet collection, since it's without inventory number and info about find-spot. Probably around the same dimensions as the example from Livrustkammeren from Sweden (128 cm) just with a longer grip. It looks very much like the Tude Å sword with the spheric pommel. 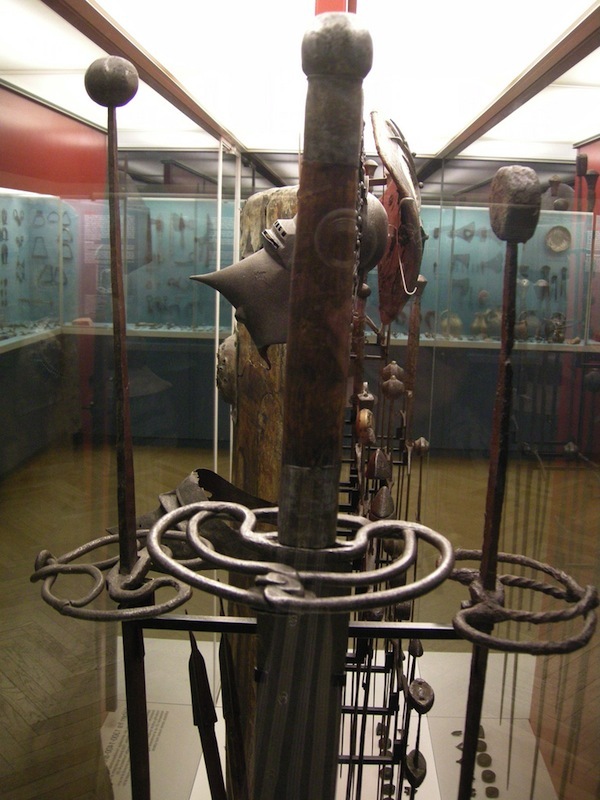 Here is Hoffmeyer's plate XL of pretzel-hilted swords in the Nationalmuseet. So we have at least 5 "pretzel"-swords at Nationalmuseet in Copenhagen - the a-d shown in Bruhn-Hoffmeyers book and also the Tude Å sword that is not included on plate XL. e) From E.A. Christensen's collection - hard to see the guard from the picture if it is a "pretzel"? So from Koppeschaar's photos we can perhaps locate some of the swords. 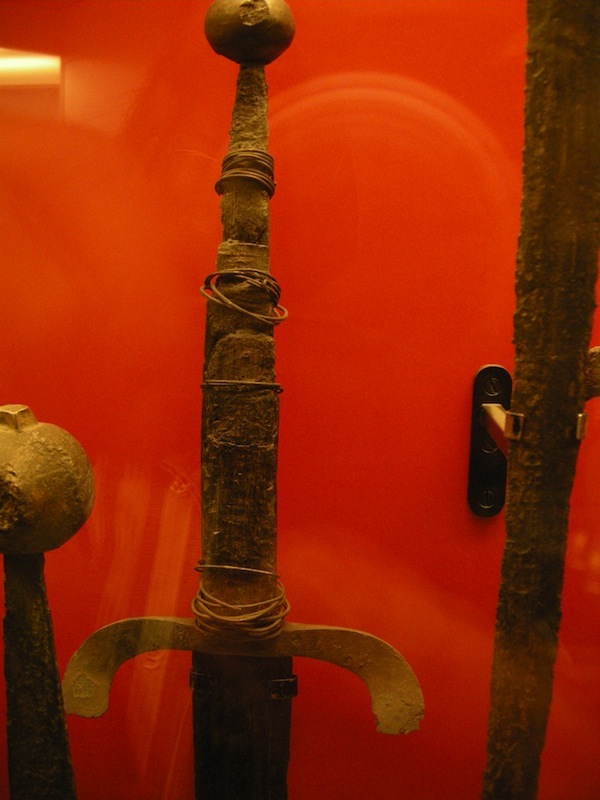 It seems 3 other pretzel-swords are in the exhibition beside the Tude Å sword (see attachment). It is clear that the central sword on the picture is the b) sword in Plate XL. 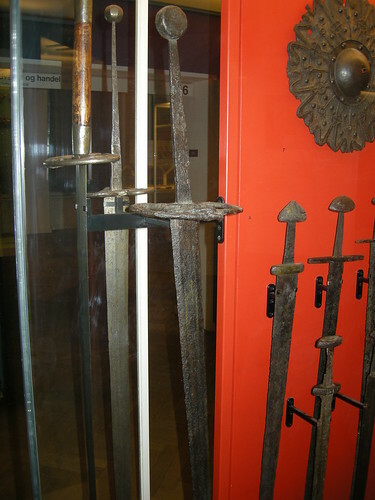 Also at the Nationalmuseet you have at least 3 examples of the C-guard type swords ("halv-kringel"), both found in Hinge Sø. Two are shown in Bruhn-Hoffmeyer's book. EDIT: So D 4445 + D 4446 should based on the consecutive inventory numbers both be from Hinge Sø. The D 4446 sword is shown on Plate XXXVIII a) is the one on the image below from Nationalmuseet (see attachment). The sword with no inventory number on Plate XXXV b) I don't have any more info on, yet. The text (Mollerup 1908) is a bit unclear, but the Plate XXXVIII a) (D 4446) sword shown in Bruhn-Hoffmeyer should be the 141 cm long sword that has preserved wood on the handle and a "ball" pommel, while the Plate XXXV a) (D4445) sword shown in Bruhn-Hoffmeyer has a pear-shaped pommel and should be 135 cm. They both have brass inlay showing factory marks. The b) sword has a minuskel-a over a wolf like figure and the a)-sword has an a, three stars and a bishop staff. The sword (D 4445) is also shown in illustration (see attachment) where the C-guard ("halv-kringel") is more obvious. Jussi Ekholm's post above also showed a picture from Finnish National Museum with a C-guard sword just left of the pretzel-sword. The sword showcased at Nationalmuseet is the D 4446. Hinge Sø Sword (D 4445) with C-guard. Source: Nationalmuseets anden afdeling. Redegørelse for dens virksomhed siden 1892. W. Mollerup (1908), page 12-13. I suspect that the sword on the left is (a) with the distinctive "knot" in it's "pretzel", and on the right is probably (d). Here's a surprise... whatever the ID, the right-hand sword has a large geometric inlay in yellow metal. It looks like a design I would have expected to see on a blade hundreds of years older, but with this blade type and long grip, I would still think it is contemporary with the other similar 15th-16th c. swords and not an ancient re-hilted blade. A Swedish soldier with a long-gripped sword (and distinctive sword-staff) appears in the sketchbook of Paul Dolnstein, a landsknecht mercenary who fought for the king of Denmark against Swedish rebels in 1502. The hilt of the sword cannot be clearly seen, but may be a pretzel or other type of curved grip. Dolnstein shows great attention to detail in illustrating both enemy Swedes and fellow landsknechts, so it seems he was accurately representing arms and armour he witnessed at that time. The Swede in this illustration may still be caricatured to some extent... a peasant carrying his own kit and canteen into battle, with clumsy over-large weapons, being dispatched with a humiliating blow to the groin. Yeah I agree the inlay design looks from an earlier period - is it like something you have seen before? Also the pommel (on the sword to the right) is "out of place" being disc-shaped (Oakeshott type G) instead of the facetted pear-shaped OR ball type pommel we see from other Scandinavian swords from the 1400 - 1500 hundreds. But if the sword to the left of the picture is perhaps the a) one on Plate XL (without inventory number and the knot on the pretzel), and the sword in the middle of the picture is clearly the b) one (787) on Plate XL ; then the sword on the right of the picture could be a sword with the same large size of pretzel - so either c) or d). So hard to see on the Bruhn-Hoffmeyer illustration, whether they have round or disc shaped pommels. I think its possible that the Swedish soldier might have carried a pretzel sword - shame Dolnstein didn't make the Swede carrying his sword-staff a little higher so we had a view on the hilt. But the pommel seems to be a "fish-tail" (Oakeshott Type V), right? I don't think we have any pretzel swords with this type of pommel, so it could be another kind of two-hander the Swede is carrying. The Dolnstein sketch also shows a sword with a s-curved cross-guard carried by the landsknecht-guy on the right in his scabbard -> these were prominent in Denmark (at least when seeing church paintings). Here an image from Tingsted Kirke on Falster quite close to where I live (see attachment) - it's dated from 1500-1520. So funny that episodes from the Bible were portrayed in contemporary fashion! This kind of one-handed sword with an S-guard in the plane of the edges has been found in Denmark. Here is an example from Svendborg where the guard looks precisely like the sword the guy on the right has. One quillon ends on a "ball", the other doesn't. Herod and the slaying of the babies with illustration of two swords with s-curved cross-guards. the sword on the right of the picture could be a sword with the same large size of pretzel - so either c) or d). So hard to see on the Bruhn-Hoffmeyer illustration, whether they have round or disc shaped pommels. (c) and (d) seem very similar to me, I think they both might have G pommels... wish I'd been able to get better scans, but the plates are not very big in the first place. I think it is (d) that is on display with the inlay though, the blade is in noticeably better condition. Also very common in Germany and among the early landsknechts - probably an early form of their distinctive katzbalger swords. 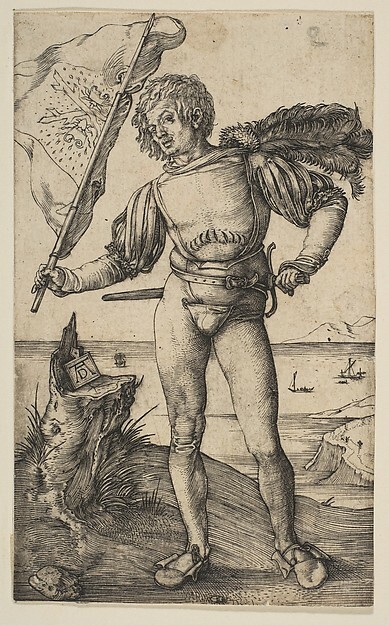 They can be seen in many engravings from the early years of the 16th century; Albrecht Durer illustrated one as early as 1495, but this example is from around 1502. Here is an example of the genuine article, formerly in the Higgins Armoury. How common should I suspect pretzel-shaped crossguards were used by the Medieval Norse around the 15th century? I'm creating a few 15th century Swedish units for a total war mod (video game version of a table top miniatures war game), and I would like to attempt to make the units as historically correct as possible. What are the advantages to having a pretzel-shaped crossguard?